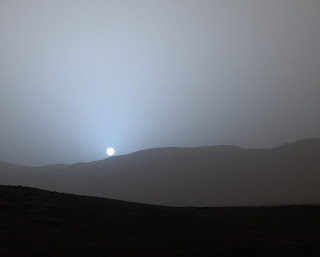 NASA's Curiosity Mars rover recorded this view of the sun setting at the close of the mission's 956th Martian day, or sol (April 15, 2015), from the rover's location in Gale Crater. This was the first sunset observed in color by Curiosity. The image comes from the left-eye camera of the rover's Mast Camera (Mastcam). The color has been calibrated and white-balanced to remove camera artifacts. Mastcam sees color very similarly to what human eyes see, although it is actually a little less sensitive to blue than people are. Dust in the Martian atmosphere has fine particles that permit blue light to penetrate the atmosphere more efficiently than longer-wavelength colors. That causes the blue colors in the mixed light coming from the sun to stay closer to sun's part of the sky, compared to the wider scattering of yellow and red colors. The effect is most pronounced near sunset, when light from the sun passes through a longer path in the atmosphere than it does at mid-day. wow,looks like the trajectory of the sun tells that the location of this video is right at Mar's Equator? Wonderfully made!